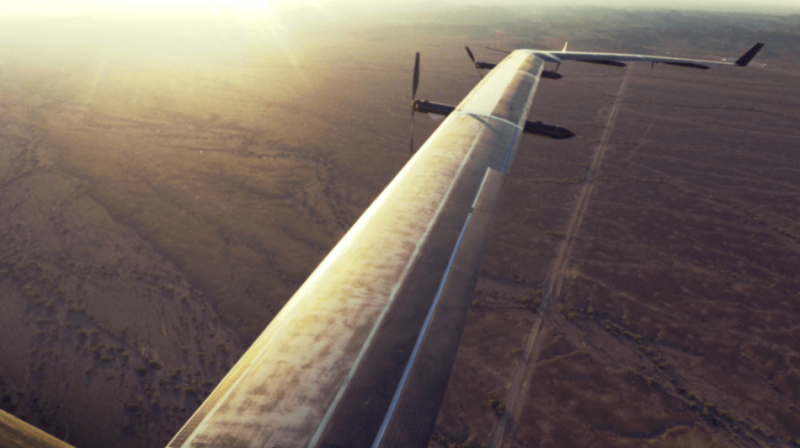 Social networking giant Facebook (NASDAQ: FB) last week reported the first successful full-scale test flight of its ambitious Aquila solar-powered high-altitude unmanned aircraft. It’s part of an ambitious goal to bring four billion more people online — more customers, freelancers and maybe even partners for your business. “After two years of engineering, I’m proud to announce the successful first flight of Aquila — the solar-powered plane we designed to beam internet to remote parts of the world,” wrote Facebook CEO Mark Zuckerberg in a post on Thursday. The maiden flight took place before dawn in Yuma, Arizona, on June 28. Facebook’s original mission was to fly Aquila for 30 minutes, but everything went so well that the company decided to keep the plane up for nearly 96 minutes. It was a significant milestone and step forward in Facebook’s quest to use drones to beam high speed internet from the sky to the nearly four billion people (60 percent of the global population) without internet access, 1.6 billion of whom live in remote locations with no access to mobile broadband networks. “Over the next year we’re going to keep testing Aquila — flying higher and longer, and adding more planes and payloads. It’s all part of our mission to connect the world and help more of the four billion people who are not online access all the opportunities of the internet,” Zuckerberg said. “When complete, Aquila will be able to circle a region up to 96 km in diameter, beaming connectivity down from an altitude of more than 60,000 feet using laser communications and millimeter wave systems,” added Jay Parikh, Global Head of Engineering and Infrastructure at Facebook. “Our goal is to have a fleet of Aquilas flying together at 60,000 feet, communicating with each other with lasers and staying aloft for months at a time — something that’s never been done before,” continued Zuckerberg. It’s worth reiterating that Zuckerberg and his company’s Connectivity Lab, the group working on the state-of-the-art internet-delivery drone, intend to bring four billion more people online via the Aquila project. That’s four billion more potential online customers, freelancers and maybe even partners! The opportunities of the internet are endless, especially with more people online. From expanding the customer base for online businesses to enabling creation of new services and new revenue streams on top of traditional ones and increasing global visibility for brands, an increasingly connected world cod be good for many. It’s not surprising, therefore, that Google (NASDAQ: GOOG), another internet giant and major Facebook rival, is also working on a similar project, pushing its Project Loon, which would use high-altitude balloons to distribute connectivity and bring people in remote parts of the world online. Elon Musk’s SpaceX, too, aspires to use satellites to cover the globe with internet connectivity. Of course, both Facebook and Google have plans of their own on how they would tap this new pool of internet users. Their business models depend on overseas growth and they are determined to reach every single person on the planet. But, savvy entrepreneurs and small businesses also stand to benefit if the high speed internet connectivity projects are successful in bringing more people online. Moreover, the race to bring affordable internet to hundreds of millions of people in more sparsely populated and hard-to-reach stretches of the globe could also usher in an important new era of rigorous experimentation and innovation not just from technology giants like Facebook and Google, but also from enterprising start-ups touting the next big thing.